Future body donor, Mrs Yvonne Luvono, flanked by UKZN Clinical Anatomy staff. 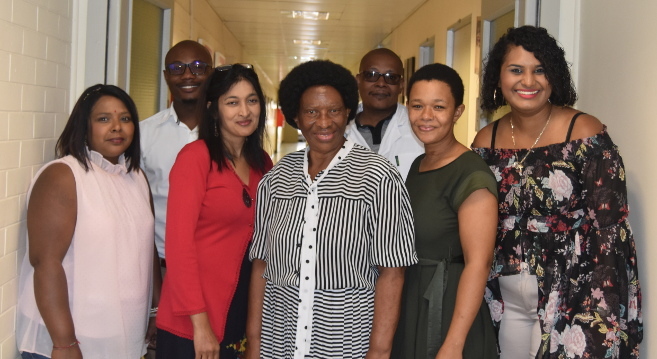 The 2019 annual Dedication Ceremony held by the Discipline of Clinical Anatomy was attended by families of previous body donors, potential body donors, religious leaders, Anatomy Department staff and second-year Medical students to honour those who donated their bodies for medical training and research purposes at UKZN. ‘This year, we invited our second-year Medical students whose curriculum includes dissection,’ said Anatomy lecturer, Dr Carmen Rennie. ‘We want them to understand the importance of Anatomy, the sacrifice made by the body donors and the importance of respecting cadavers,’ said Rennie. Luvono agreed to donate her body for medical research and training as she feels it is a good way of giving back to the community. ‘I had a lot lot community development ideas in mind but unfortunately I couldn’t pursue them due to old age and ill health. Now, the least I can do is to contribute towards community upliftment by donating my body,’ said 70-year-old Luvono.